Transient global amnesia is a clinically distinct syndrome characterized by the acute inability to form new memories. It can last up to 24 hours. The diagnosis is dependent on eliminating other more serious etiologies including toxic ingestions, acute strokes, complex partial seizures, and central nervous system infections. Transient global amnesia confers no known long-term risks; however, when abnormal signs or symptoms are present, they take precedence and guide the formulation of a differential diagnosis and investigation. 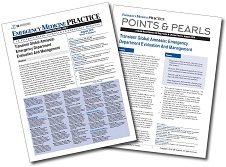 In witnessed transient global amnesia with classic features, a minimalist approach is reasonable, avoiding overtesting, inappropriate medication, and medical interventions in favor of observation, ensuring patient safety, and reassuring patients and their families. 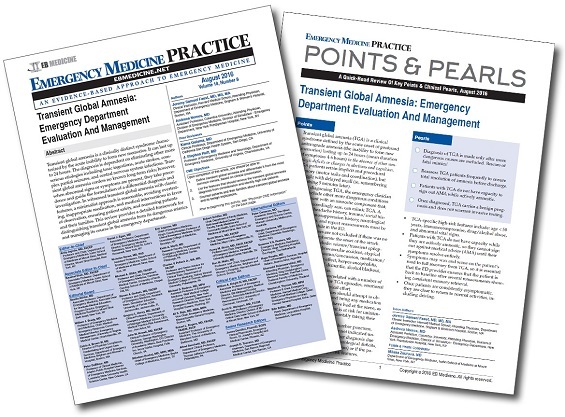 This review provides a detailed framework for distinguishing transient global amnesia from its dangerous mimics and managing its course in the emergency department. A 60-year-old man with no significant medical history is brought to the ED by EMS after 2 hours of sudden memory loss. His wife has been with him since the onset of symptoms, when he started asking her the same question repeatedly every few minutes. The patient is calm, cooperative, and oriented to person, place, and time, but he frequently repeats himself and does not appear to be forming new memories. He knows what he did yesterday and this morning but cannot seem to recall events of the past few hours. He is perseverating about what he was doing 1 hour ago. When you step away and subsequently return to the bedside a few minutes after the initial encounter, the patient does not recognize you and asks, “Have we met before?” The patient has no other complaints, and there are no neurologic or infectious symptoms. His vital signs are normal. You wonder if you should activate the stroke team and order an emergent CT of the brain. This was a really well written article. I now have a better understanding of the definition of TGA and feel comfortable discharging these patients home without a stroke workup.